“How do you get to all those places in your videos?” Several people have asked me this question recently. The answer is by bicycle, for the final 15 kilometres at least. When I have to travel further I use the combined modes of train and bicycle. In that case the bicycle is a public-transport bicycle (OV-Fiets) most of the time. 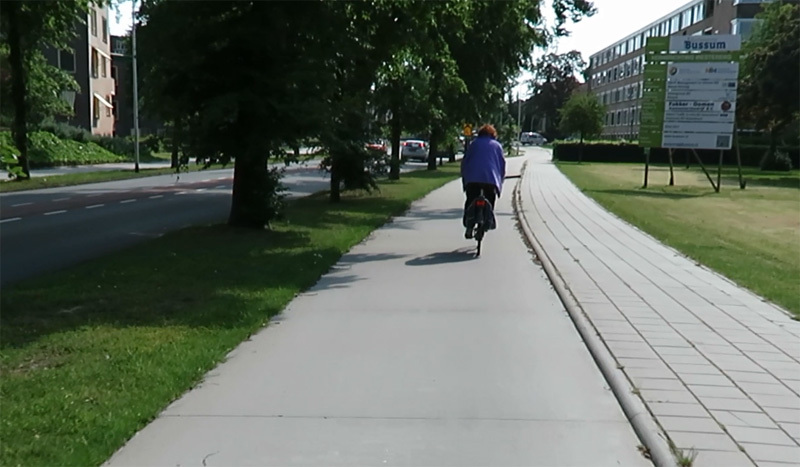 A wide unidirectional separated cycleway in Bussum, with a kerb separated walkway. The surface is made of big slabs of very smooth concrete. There is an identical cycleway on the other side of the roadway. I have my own bicycles in Utrecht and ʼs-Hertogenbosch, so all the trips for posts in and around those two cities are made on my own bicycle. To film for all the other posts around the country I take the train to the nearest station and rent a bicycle there. Usually there is a train station less than 5 kilometres from the location where I want to film. Only on one occasion I had to cycle over 15 kilometres one way, because there isn’t a nearer (convenient) station to the new bridge of Naaldwijk. In that case, however, I could combine filming. I not only filmed that bridge, but also the new Delft station, where I rented my bicycle that day. 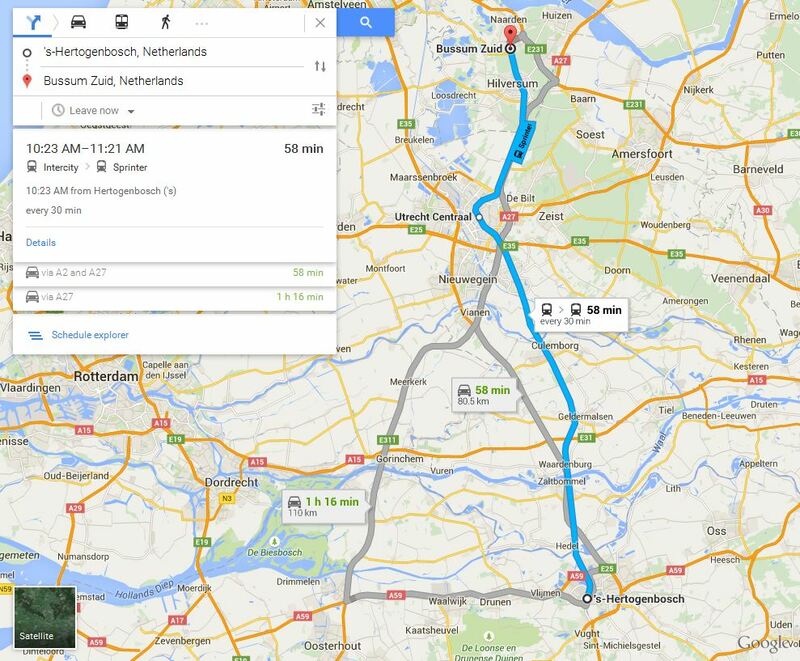 So the videos for Delft and Naaldwijk were actually filmed on the same trip. 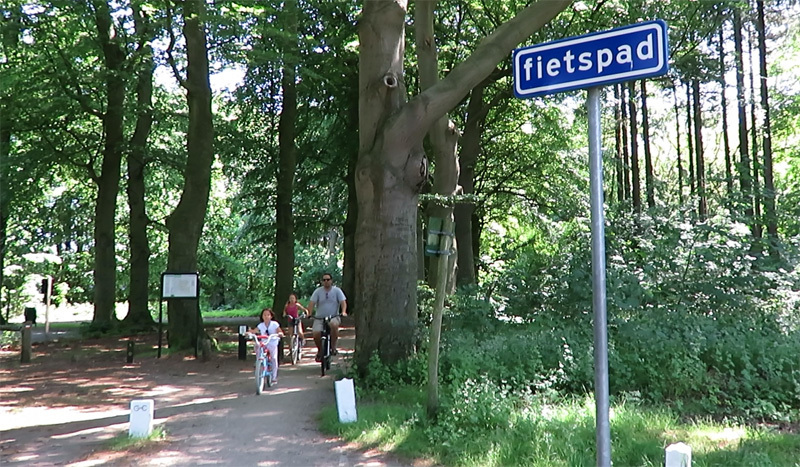 To show you how convenient train-rental-bike travel is, I filmed the 4km (2.5m) ride to a location where I already filmed twice before: the heath north of Hilversum. For that location I took the train from ̓s-Hertogenbosch to Bussum-Zuid. Trains run every 30 minutes on this route and the 80.5 kilometre trip (car route) takes only 58 minutes by train. That is exactly the same time it would take by car. So this also explains why I do not own a car. Most of the time the train is just as fast, or even faster than going by car in this country. We travel ticket-less in the Netherlands. Like most people I have a public transport chip card and we simply swipe our card at the start and end of a journey in public transport (and when we change providers). The nationwide system is comparable to the Oyster Card in London. There are several different types of cards. There are pre-paid cards that you need to charge before you can use them, but mine is a subscription for free travel on a certain route (ʼs-Hertogenbosch-Utrecht). If I travel outside my route I have to pay for those trips at the end of every month. The amount for that month is simply deducted from the bank-account that is connected to this card. My public transport chip card is also connected to my OV-Fiets subscription (for which I pay 10 euros per year). Every rental of an OV-Fiets (€3.15 for the first 24 hrs) is also included in the total amount that I have to pay per month. This system means I never have to carry any cash for either train journeys or renting a bicycle. This makes getting on and off a train and renting a bicycle very quick. The video shows you just how fast and convenient the procedure is. On this particular journey I cycle from the train station I through the entire town of Bussum on very convenient cycling infrastructure to the forest and the heath. It takes me less than a quarter of an hour to get to where I wanted to be. Getting somewhere in The Netherlands is usually this easy and that makes my trips to a film location like a nice outing. I really enjoy getting to places that I have never visited before and I love cycling in those unknown places. My blog would not have existed as it is now if the OV-Fiets system didn’t exist. It is has been a while since I wrote about OV-fiets so let’s do a quick recap with updated figures. Every year about 1.5 million journeys are made on an OV-Fiets. This number grows every year. In the coming years the Railways expect 200,000 journeys extra every year. The current trips are made on 8,500 bicycles from 252 rental stations by 180,000 subscribers. (Those figures are from the end of 2014). To be able to grow so fast the Railways announced in June 2015 that they will buy at least 1,000 new bicycles per year in the coming 3 years. The Public-Transport bicycle is very successful but only residents in the Netherlands can use it. That is because a Dutch bank account is required to be able to pay. This doesn’t mean people from abroad cannot rent bicycles at Dutch railway stations. 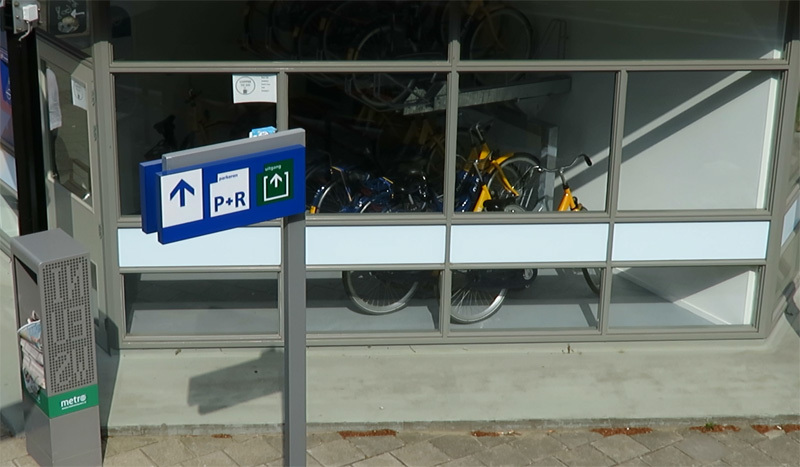 Most stations with a manned bicycle parking facility offer ‘normal’ rental bikes too. The list of rental locations is quite impressive. But renting such a bicycle is a bit more complicated and also more expensive (about €7.50 per day). It usually requires a cash deposit of quite a bit of money and you will have to present proof of your identity. The only reason I do mention OV-Fiets on my blog, even though most of my readers won’t be able to use it, is that it is a successful part of the efficient transport system in The Netherlands and I use it a lot myself. The bikes of the OV-Fiets system are parked in a small indoor facility that you can enter with your subscription pass. The video shows how I rent a bicycle at an automated station. People have asked what happens if the bicycle is not okay for some reason. Bicycles can become unusable if they have a flat tyre or if the saddle can no longer be adjusted. In winter you will have to check the batteries of the lights as well. Occasionally you will end up with a broken bike. That doesn’t mean your money is gone. You simply return the bicycle right away. The machine always asks if the bicycle is in working order. If you answer “no” and you have just rented the bike the fee is not charged. You leave that broken bike and simply rent another one. The broken bike is taken out of the system until it is fixed. The organisation is warned automatically so they can send a mechanic. Of course this can also happen in a manned station. I once tried to ride away in Amsterdam and after a couple of hundred metres I heard a loud bang and felt something smashing against my right leg. To my surprise the hard plastic chain case had broken in two and one part had got entangled in the chain that got totally stuck because of it. I walked back to the rental station (lifting the back wheel up), showed staff what happened and they gave me a new bicycle right away at no extra cost. A ‘Fietspad’ (non-mandatory cycleway) of the Gooi- and Eemland cyclepath society. I showed you earlier how these cycleways were built over 100 years ago. This is in Crailose Bos (Woods of Crailo) the end of this week’s video. So that is how I get around the country! Wow. The Netherlands is so small. A journey from my city of Edmonton to nearest major city of Red Deer is 140 km away and that would take you more than halfway across the Netherlands. And going to Calgary would take you all the way, as it is about 300 km. Trains should be faster in the Netherlands. 200 km/h on the route from Eindhoven to Utrecht, 250 km/h from Utrecht to Amsterdam, 300 km/h on the route from Enschede to Amsterdam (this is because of the German ICE trains), and 200 km/h on the route from Groningen to Utrecht, passing through Zwolle and Almere. Probably 200 km/h or maybe 160 on the route from Nijmengen/Arnhem to Den Haag through Den Bosch. That would be a very fast train system. It would almost feel like the whole country had a metro system. Dank voor het uitleggen van de OV-fiets leenprocedure. Dat voorkomt hulpeloos klungelen, ik ga het volgende keer echt wagen om een ov fiets te huren. Mooie omgeving trouwens daar! Je moet overigens wel eerst een abonnement op OV-fiets hebben. Alleen een OV kaart is niet voldoende. I was fortunate to spend some time in Utrecht earlier this summer. I stayed on Biltstraat just east of Vittevrouwensingel. The area would be called “mixed use commercial” in the USA (there are apartments above businesses and restaurants at ground level with a wide sidewalk, cycle track, motor vehicle parking (both sides of the street) and two motor vehicle travel lanes). Biltstraat seems to be a hybrid destination-arterial street but it works VERY well. Time-lapse photography showing the traffic flow over the course of a day would be very interesting IMO. Even at peak hours, flow was good and at other times the roadway was almost empty of cars but businesses appeared to be doing well. Here in the USA business owners fear that increasing access for bikes and decreasing same for cars will hurt business. Biltstraat seems to be a good counter example. I’d appreciate your comments. Photos in GoogleEarth suggest that Biltstraat was reconfigured in 2007 to add the cycle tracks. An interesting case study! Nice adventure, thank’s for sharing. Brilliant. While there are other significant barriers to Melbourne Bike Share succeeding (e.g. helmet law) it’s weird that every other form of transport (including driving) is subsidized but bike share is somehow meant to be profitable. It should have been made part of PT and use integrated travel card (our’s is “Myki” system.) It seems so obvious! Despite Myki being insanely expensive (https://sites.google.com/site/cheaperthanmyki/) it has no scope beyond PT. Hello! I am quite curious, how many bikes in Netherlands? Are they really more than people in Netherlands? Yes there are really more bikes than people in the Netherlands. About 18 million bicycles for about 17 million people. At 4:59, I see a cycle lane or a red area marked off with dashed lines. What is that for, I see a separate cycle path on the other side and you are on a cycle path at that moment, so what is it for? Given that it ends up right against a traffic island, it doesn’t look like cycle infra. I guess it is just an area to separate the two directions of car travel. Perhaps red has been chosen because like many cycle lanes it is “don’t normally use, but may enter if necessary”, but that’s just this layman’s guess. That is not a cycle lane. It is as André also says, space to separate the car lanes. The entire length of the road has that visual separatation. In the sustainable safety policies of the Netherlands it is advised that travel lanes in the opposite direction should be separated if possible. Here that was done with a strip of a darker colour. The fact that the lines on either side are dashed means you can use that part of the road if necessary. Good catch on that. The coloring is interesting. @ 6:45 after the roundabout you are riding on a red path, red continues for the car park but you are supposed to skip that (unless going there) and follow on to the non red concrete. One important point about OV Chip Cards is that they expire after 5 years and will only provide refunds of the remaining balance to NL bank accounts and they will not transfer the balance to a new card. This is extremely irritating to those of us who travel to The Netherlands frequently and keep a balance for a variety of travel needs. Why they can’t do a refund to an IBAN or xfer to a new card is befuddling. Great card for a great system that rips you off every 5 years. I think they will only do that for NL residents. I spent considerable time with them trying to xfer the balance and they said they couldn’t do it but could deposit it in my NL based bank account. Not very visitor friendly. At least it is only once per 5 years. That is not too terrible. I think you got lucky with that broken bicycle. I have had to switch OV-fiets twice (once a flat tire, once a loose saddle), and in both cases I had to send an email after I had received the monthly overview of costs to stop them from charging me double. Hmm, maybe you had a stroke of bad luck there? I have had this happen several times now over the years but every time it went right. Even when I got two bikes in a row with a broken saddle I was only charged the third bicycle! I would not think that a plastic chaincase is as reliable as an OV Fiets (grammatically, you do not have to say bike after fiets, unless you are indicating it is a translation) should. I also question why there is a battery powered light system, at least for one of the two lights. That is somewhat strange to me. 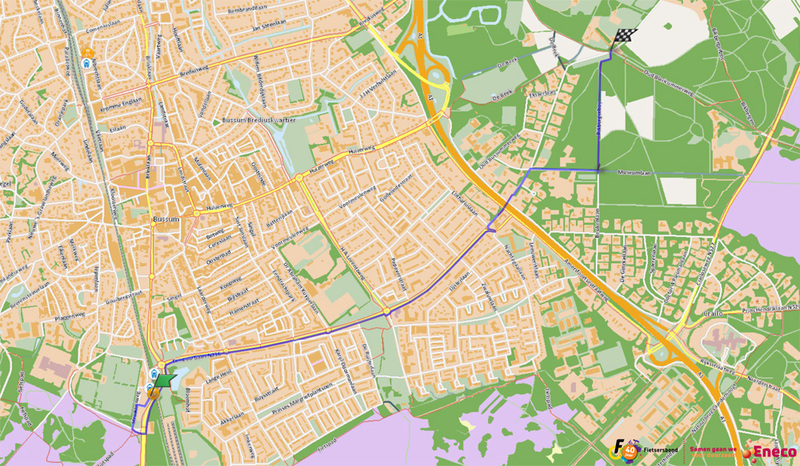 This entry was posted on 7 July 2015 by Bicycle Dutch in Original posts and tagged Bussum, OV-Fiets, ride.